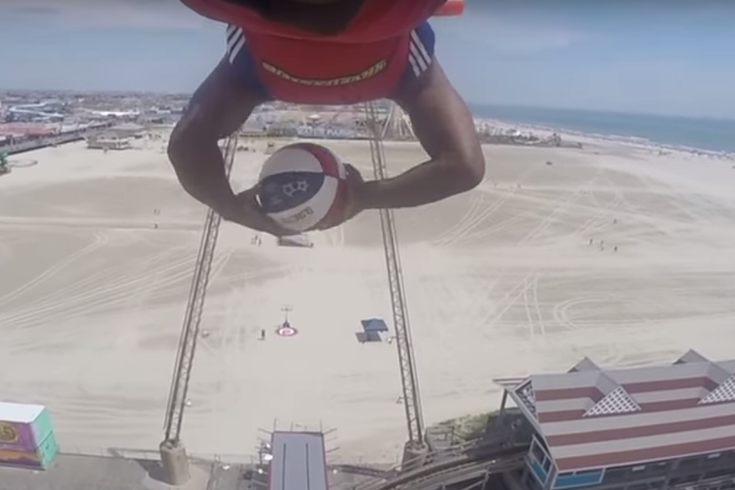 Harlem Globetrotter Bull Bullard attempts a trick basketball shot while on the Sky Coaster ride at Morey's Pier in Wildwood. Last year, the Harlem Globetrotters completed their first trick shot off an amusement park ride at Morey's Pier in Wildwood, sinking a basket from atop the AtmosFEAR ride. On Wednesday, the team was back in town for a string of performances through the weekend and decided to try another shot off a ride — this time, with Globetrotter Bull Bullard trying to get nothing but net while swinging in mid-air on the Sky Coaster. Impressive! However, we're a little disappointed they didn't ask for suggestions on where they should do their next trick shot like they have in the past. Any frequenter of Wildwood would be impressed if a Globetrotter could hit a shot on a basket attached to a moving tram car a hundred feet down the boardwalk over a sea of teenagers. Guys, if you're reading this, make that happen. Tickets to see the Globetrotters at the Wildwood Convention Center July 29-30 are available here.